Since my lecture on the subject of Music Restitution – available elsewhere on this blog – I have been forced over the intervening weeks to think more seriously about how we quantify the idea of musical loss. After all, ‘restitution’ is only another way of ‘making good’ or ‘restoring’ something that was taken away. Quantifying ‘loss’ is both more difficult than I had previously believed, yet at the same time, it’s more obvious. Over successive decades since the end of the war, it has been far easier quantifying ‘gains’ – these were gains made by the many countries of refuge. Gains are easier to tot-up than losses – gains are tangible, losses are vague, verging on the abstract. Losses can only be estimated and are arrived at through conjecture. For that reason, it’s worth having a look at how loss is extrapolated from the musical voids that resulted from Nazi policies starting in 1933. The other challenge is establishing who it was who suffered from the loss. 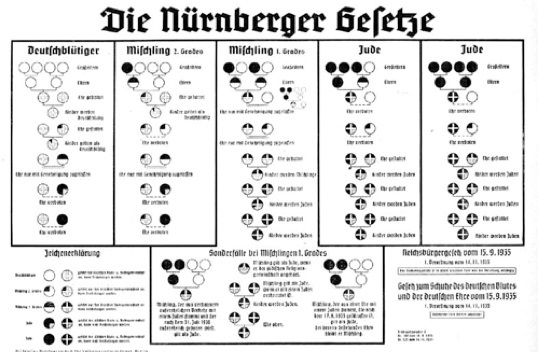 In my lecture, I tried to demonstrate that the musical loss inflicted by Hitler’s regime was felt by two parties: the individuals forced to flee and the publics from whence they fled. If an object is stolen, it’s far easier according it a value that can be translated into a monetary price. If Klimt’s Goldene Adele fetched $135,000,000 at auction we know what was stolen and what it was worth in monetary terms. But value is not always the same as price. And placing a value on the losses suffered by musicians, academics, publishers, agents etc. along with the value suffered by the public that lost much of its musical environment is a more difficult concept to quantify. What would the un-composed works of a Walter Bricht fetch at Sotheby’s, for example? After fleeing Austria, and the Vienna Philharmonic cancelling a performance of his symphony as a result of the Anschluss, he never wrote another note. Erich Zeisl, whose output consisted mainly of Lieder, never set another German text after Komm süßer Tod, just before leaving Austria. And Bricht and Zeisl were not the only ones to lose their voice once forced to leave their homeland. There was Arthur Willner, Leopold Spinner, Manfred Gurlitt, Berthold Goldschmidt and dozens more, who either stopped composing or were seriously derailed. To make things easier, let’s imagine an updated tabula rasa of every performer, dancer, singer, composer or individual working in the music industry or within music scholarship being forced to flee because of their sexuality. As I have already mentioned in my article on Conchita Wurst, the social integration and legal emancipation of Jews in the 19th/20th centuries and LGBT (Lesbians, Gays, Bi- and Transsexuals) in the 20th /21st centuries share much in common. 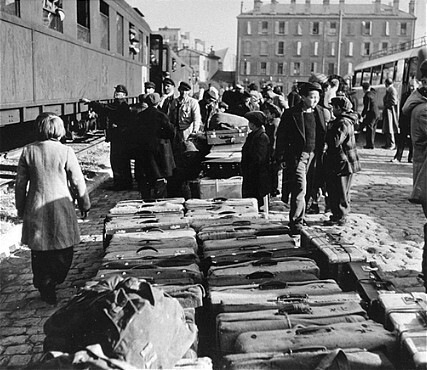 Prior to legislative changes, few communities were more despised and equality, along with slow social integration, was only achieved painfully against the resistance of the same obstructive alliances of religious groups, political conservatives, bone-headed bigots and the Russian political establishment. As the parallels seem so startling, I believe it provides a useful model for trying to conceptualise this question of loss, especially as both minorities gravitated so heavily towards music. Assuming such a decree was to be made – a Taliban takeover for example of the western world’s culture secretariats — at a stroke, New York’s Broadway and London’s West End would be virtually closed down. Opera houses, orchestras, music colleges, publishers, agencies and managements would be decimated. The question of whether the public could then be viewed as ‘victim’ becomes nearly redundant. But what about the individuals, who were made to flee? In addition to stage works, a fair number of classical performers would also disappear – and not just musicians, but actors, writers, dancers, designers, agents, academics and so on. It’s hard keeping the logic of this comparison believable, but let’s assume that the only countries that would take in LGBT refugees were Indonesian. Agents and publishers and people who had enjoyed successful creative careers would find themselves penniless and having to start over in an environment that had no tradition or little understanding of the musical environment from whence they had fled. Some lucky ones might become successful in their new homelands. Others may be able to reinvent themselves, but most would find themselves unable to do anything other than what they had always done: perform, write, study, manage and dance western classical music in a homeland where there was no tradition of western classical music. This comparison may seem far-fetched and many would retort that cultural differences between former European homelands and their North and South American countries of refuge were not as great as the difference between the West and Indonesia. True. But leaving aside the fact that even Golda Meir in her autobiography, writes of having ‘to re-train musicians from Frankfurt to raise chickens’ in Palestine, European refugees also landed in Shanghai and Manila. It thus comes down to questions of perception. To some of these refugees, Oklahoma City or Managua were as far away and unfathomable as Mandalay and Bangkok. Apologists who only see the undoubted benefits brought by European musicians to Oklahoma City and Managua could understandably maintain that any losses felt by former refugees were balanced by the safety and security they found in new homelands. They may have earned more money and lived in larger houses. Their children would have seemed happier integrating in the less formal schools found outside of Central Europe. 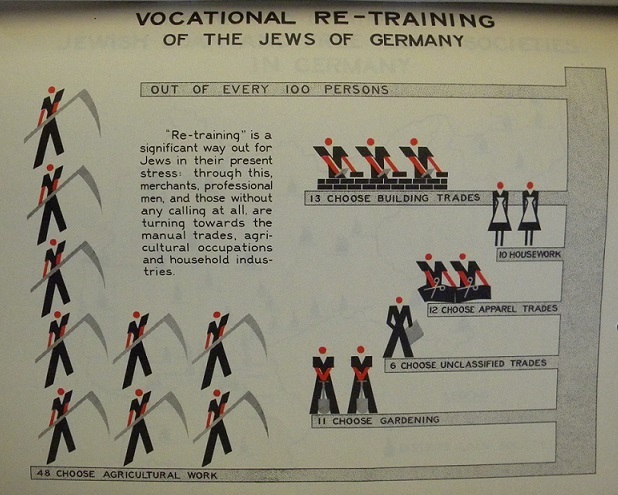 The appearance to those who remained in Nazi Europe certainly gave every impression of refugees jumping out of the frying pan and into Saks Fifth Avenue. This was definitely the impression held post-1945 when many returned to Vienna and Berlin and found their former persecutors suffering the material, political and familial losses of Hitler’s ‘Total War’. “You were the lucky one! You got out when you could!” This was the sentence most returning refugees report hearing. It was never, “You were the lucky one! You got out before we could murder you and your family.” How difficult to speak of ‘loss’ under such circumstances. 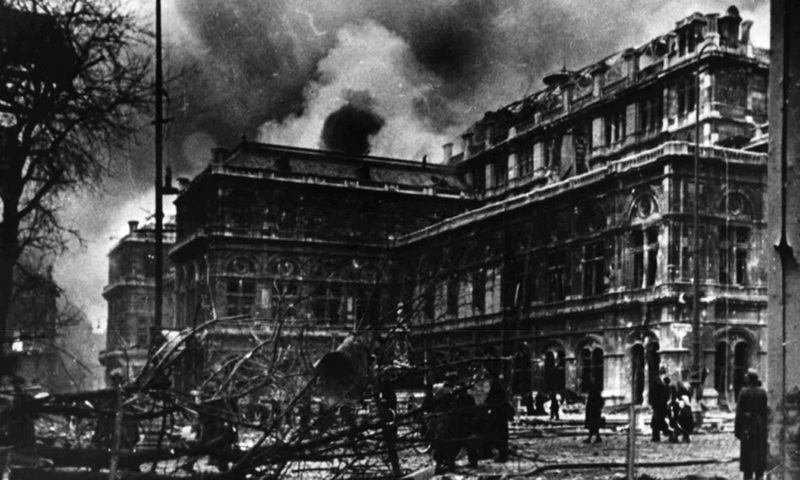 Yet to establish what losses were endured, it’s necessary to look at the concomitant phenomena as found in letters, testimonials, journals and above all, the actions of music émigrés themselves after 1945. This examination of musical loss AFTER Hitler, focused on exiled composers and musicians, is something that few have undertaken. If it has been undertaken, it was only with a view of examining their accomplishments in new homelands: in other words, the ‘gains’ rather than ‘losses’. The lost inner sense of purpose and motivation to please a specific, ever familiar public, prior to emigration is never considered. By not reconciling pre-Hitler developments with post-Hitler output, we ignore an important chapter of cultural history. I sensed this depth of cultural loss most recently when asked to translate the biography of Erich Korngold written by his wife Luzi. 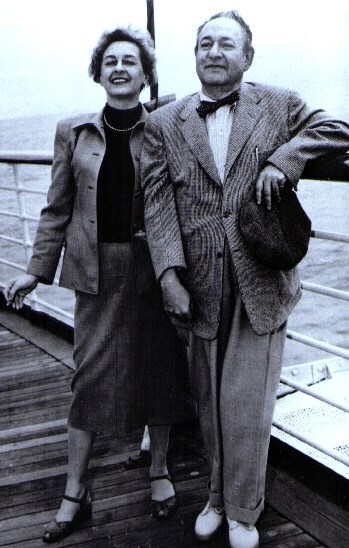 Few would dispute that Korngold was enormously successful in America, and few would dispute that he redefined the role of music in motion pictures. His English biographer Brendan Carroll offers detailed descriptions of Korngold’s contributions to cinema and explains how in the context of film and music of the time, he created dramaturgical experiences that even directors had not realised were possible. 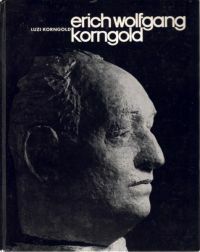 Hanns Eisler’s anti-Korngoldian ideas expressed together with Theodor Adorno’s jointly written as Composing for the Films would have been unthinkable without Korngold’s unassailable position as dominant Hollywood composer. 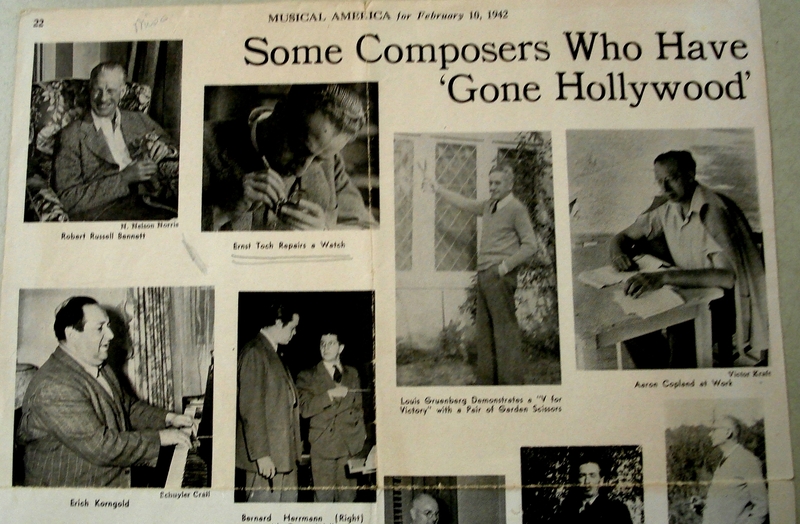 It was a position that influenced composers already working in Hollywood such as Max Steiner and fellow new-comers such as Franz Waxman. Both Steiner and Waxman were in many ways more receptive than Korngold to the idea of setting music to moving images. And yet. . . . .and yet. . . . of this triumvirate, only Max Steiner continued working for the studios and he had been at Warner Bros years before Hitler’s rise. Even more revealing, Luzi Korngold hardly mentions Korngold’s Hollywood successes in her husband’s biography. Bette Davis gets a single mention, Errol Flynn receives two and Olivia de Havilland is ignored completely. The entire period Korngold spent composing Hollywood movie music takes up only a few pages and the only movies she bothers to mention are Midsummer Night’s Dream, Captain Blood and Give us this Night. The film she writes about most is Green Pastures, for which Korngold composed only a couple of numbers and then refused payment. The entire cast of Green Pastures was African-American and Korngold saw his music as a small contribution in the fight against American racism. 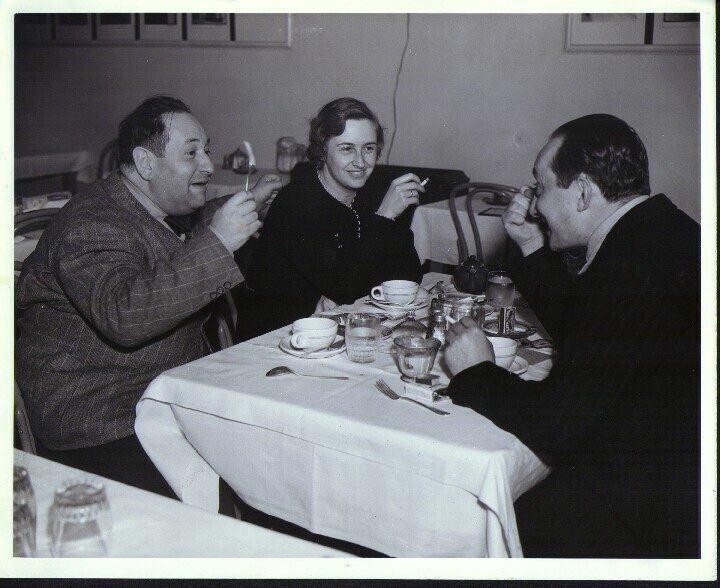 But Korngold is not alone, Erich Zeisl, Ernst Toch followed Korngold’s example and left film work almost as soon as the war was over. Mario Castelnuovo-Tedesco, Alexandre Tansman, Darius Milhaud and even Franz Waxman reduced their work over the following decade to return to what they considered ‘absolute music’, a concept that in their European worldview seemed more in keeping with their natural talents than the ‘applied music’ required by Hollywood. Of course, her biography was written in German and published locally in Vienna. Some would argue that she was countering the arguments that their life was glamorous in America, while Hitler ran rough-shod over the locals. Yes – she and her husband were aware that in the eyes of those who stayed, his work had somehow become tainted by Hollywood’s naked commercialism. But their return to Europe was ambivalent and it would have been more natural to have amplified Korngold’s American successes than diminishing them. It is this lack of Hollywood triumphalism in the correspondence and recollections of Korngold, Toch, Zeisl, Eisler and others that so firmly underlines this idea of lost time and lost work. But history cannot be made up of ‘what ifs’. 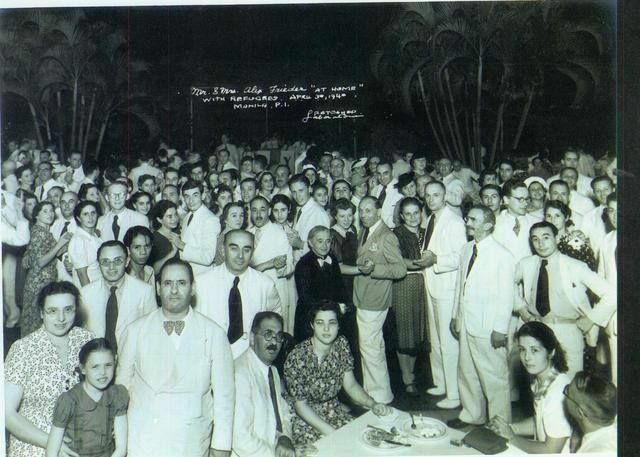 One can speculate that if Hitler hadn’t happened, perhaps Korngold would have gone the way of his friend Wilhelm Grosz and cashed in on his talent for writing popular music. Perhaps this would have led him to Berlin’s UFA studios instead of Hollywood. Perhaps he would become the leading exponent of a post-Franz Lehár generation of operetta composers. Certainly the leap from Das Wunder der Heliane to Die Kathrin suggests an organic move away from main-stream serious opera. His many operetta arrangements would not have been without influence. Yet after his Hollywood years he wrote a String Quartet, a Serenade and a Symphony, a violin concerto, Theme and Variations for orchestra, a selection of art songs and something called Straussiana. All of this seems to point towards a return to the musical soil of his youth – a return to classicism in structure; nostalgia in content. His final stage work is appropriately entitled The Silent Serenade. It would seem ungrateful to suggest that the Symphony in F-Sharp is a mishap of history. Certainly I’m not suggesting that it’s not a magnificent and much misunderstood work. But circumstances forced Korngold to turn backwards and take refuge in a past that offered more cultural identity than organic development as a Composer. 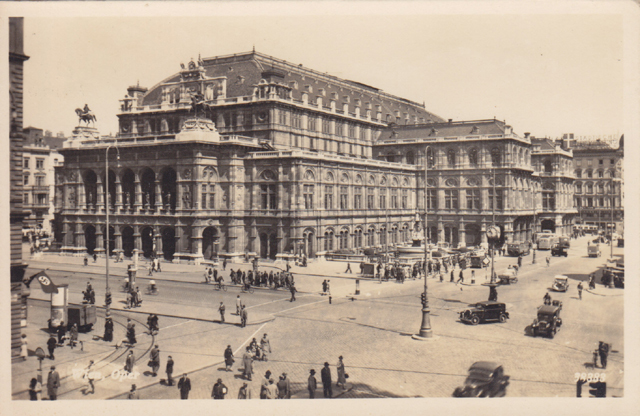 The almost panic-stricken need to return to Viennese classicism in name if not in deed is evident in the many symphonies, concertos and quartets that composers thrown out of their home countries began to write after 1945. Again, it suggests a refuge for a creative identity rather than an organic transition as artist. But how can such things be quantified? 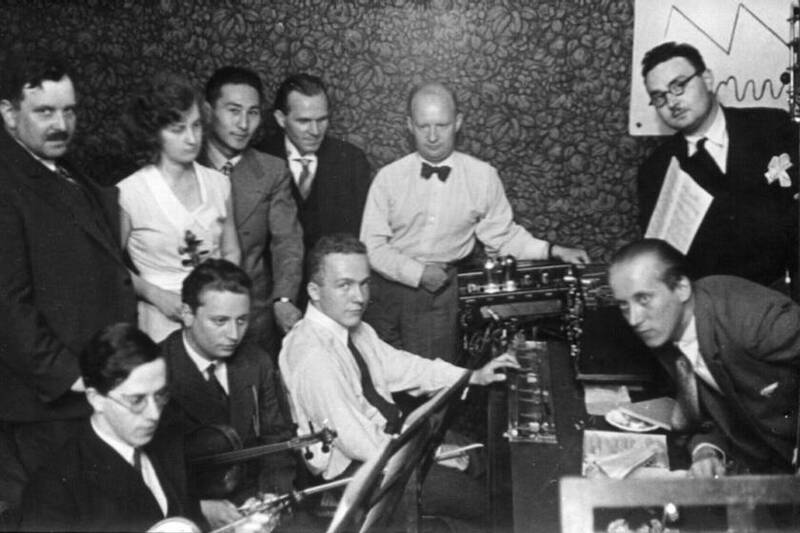 Karl Rankl, Egon Wellesz, Hans Gál, Karol Rathaus, Ernst Toch and Erich Korngold wrote symphonies after leaving Vienna and Berlin. All of them are works that despite their undoubted qualities are never performed. These were not works meant for a public, but attempts to reclaim the cultural identity they felt had been robbed. There is little that is strictly neo-classical about these returns to Germanic traditions. But one thing seems quite certain; these are not developments that would have occurred had they not been forcibly transplanted and it is this discrepancy that has been too little examined. Thanks for this very thought provoking article. Some thoughts Michael which I hope will be of interest. In discussing Korngold’s life in America on many occasions, with his two sons, it was clear to me that he regarded his film work as eventually becoming very much a means to an end. By 1945, the death of his father (who had never been happy about his work in Hollywood, as his many vituperative letters demonstrate) brought about a sense of guilt that he had somehow abandoned his true calling and with the war ending in Europe, he was determined to make amends. His famous 50th birthday interview (quoted in my book) reinforces that view. When Luzi wrote her book, I am sure she did so with a view to restoring his reputation as a “serious” composer, especially given its publication of a series of biographies of other important Austrian composers. The lack of detail about his film scores probably reflects this, as well as the fact that in the early 1960s, when the book was written, Korngold’s films were virtually unknown in Austria and had not been prepared in dubbed versions for TV. In fact, those after 1938 had not even been theatrically exhibited, as far as I know. By the way, I would not say that Korngold’s Symphony is “never performed”. Unlike Toch, Rathaus, Rankl and the others you list, Korngold’s symphony is now increasingly revived (the City of Birmingham Symphony performed it just a few weeks ago, it was heard at the Proms in London in 2013 and last year was heard in Germany, the USA and even Japan!) 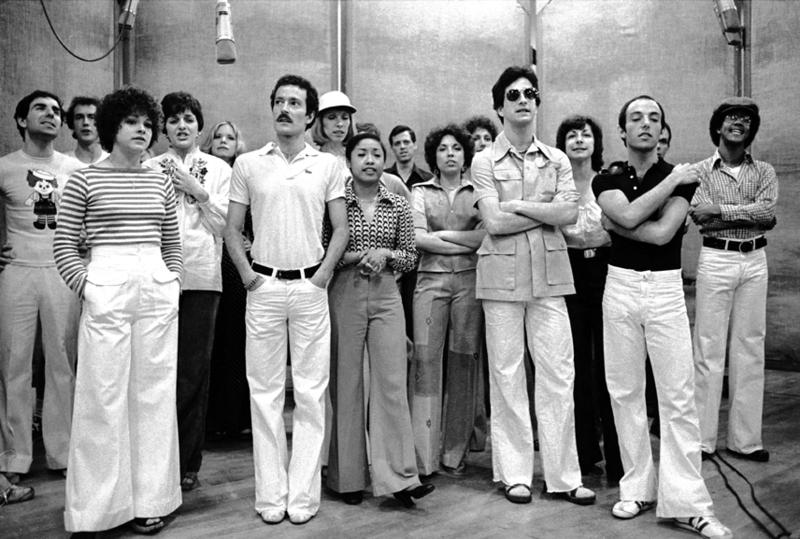 There are 9 recordings of it in the catalogue at the moment and I gather that a tenth is in the pipeline. Of all the formerly “suppressed” composers, Korngold’s comeback continues apace and shows no sign of stopping, I am very glad to say! All of what you write is true – and I’m delighted that the Symphony in F sharp is finally establishing itself. It’s a great work – but that’s not really my point. Would he have felt it necessary to write a symphony had ‘Hitler never happened’? He was putting down identity markers – perhaps for himself as well as for his many former compatriots who were willing to shove him, his wife and children into gas chambers. Maybe he would have ‘only’ landed in UFA or Wienfilm instead of Hollywood and joined Werner Richard Heymann as a great composer of operetta-films. And perhaps all of this would have been less valuable than his Symphony in F Sharp. But the point is, he was denied being able to go where his musical interests and competencies would have led. That he was supremely competent and would have even become the best bar-room pianist of all time, if this had been the only job open to him, need hardly be mentioned. As for the conflicts with his father Julius, who viewed writing ‘movie music’ as a waste of time – a conflict that bothered Erich – it still doesn’t explain why so many other film composers felt the same. Of course, some such as Rosza and Steiner saw their careers as film composers with no intention of ever doing anything else, but the list of composers who left Hollywood to pursue less lucrative careers is equally impressive. The other thing missing from all of this is what I called ‘Hollywood triumphalism’ in Luzi’s book. The most understandable thing in the world would have been to return to Vienna – reclaim their villa and remind all of their neighbours who welcomed Hitler how tragically wrong they were. When Egon Korngauth writes to Joseph Marx – a close friend apparently of Erich Korngold – that Korngold shouldn’t ever receive Austria’s State Prize because he’s ‘earned enough money already’, he knew he was hitting Korngold where it hurt. 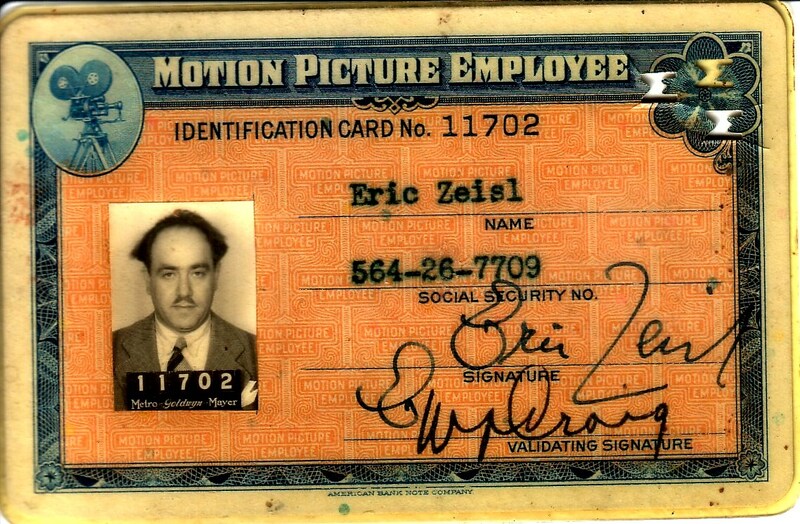 If I had not found similar correspondence and documentation regarding film work as being an artistic waste of time and energy from (among others) Zeisl, Tansman, Waxman and Ernst Toch, it would be straightforward to state that Luzi and Erich were suffering under the disappointed expectations of Julius. But it was obviously more than that: it was the disappointed expectations of their culture, their country and above all, themselves. I’m afraid I can’t quite agree that Korngold never planned to write a symphony because, among his papers is a sketch in his hand, of works for a future concert series (dated 1922) that he sent to Egon Pollak, that incorporates works he had yet to write. These include “Symphony 1” and “Symphony II”. Later events and his marriage, that eventually led him down the path of operetta saw this projected list of works never happened. George Korngold once told me that Julius was always reminding Erich (especially in America) how, as a child, he had always answered the question “What do you want to be?” with the words “Direktor Mahler”, and I think this constant harping on the subject may have had an influence on his decision to write his Opus 40. Moreover, as you know, I found a sketch of the opening of the F# Symphony dated 1919! So I’m not actually sure that the Nazis were the reason for his turning to the form of the symphony at the age of 50. I do however think that the ghost of Mahler cast a very long shadow on him. All of this is purely conjecture of course. We can never know. Brendan: I’m sure that Mahler’s shadow would most definitely have meant that EWK would have intended writing symphonies – especially while living under the same roof as Julius. Once he got out from under that roof and started to live his own life, his father’s ambition that EWM become the figure “to assure the continued supremacy of German Music” – to quote Schoenberg – by following Mahler and writing symphonies appears to have become less of a priority. I suspect – and like you, can only suspect – that the dynamics of post-war Austria, the enforced isolation of Los Angeles and the realisation that the world he knew, loved and had grown up in was gone, meant that returning to the idea of a symphony was a means of convincing himself of who he was. Generalisations are dangerous – and I was resorting to hyperbole to support my conjecture (and this is what it is) that writing symphonies – something none of the composers I listed (with the exception of Hans Gál) had shown the slightest interest in before the war – was a means of putting down cultural markers. Of course they were cultural markers that were meant for the public as well. But each composer had an individual relationship with what was seen as an out-dated idea of ‘the symphony’. Only a few of these ‘exile symphonies’ were actually commissioned, but by addressing this Ur-Austro-German musical form, it was a reassertion of identity to themselves in their now distant – and very Un-Austro-German homelands. Of course, all composers want their works to be performed, understood and appreciated by the public. But these symphonies were written as acts of desperation. Indeed, this is what Toch himself describes. His symphonies – in contrast to those of Wellesz and Rathaus – are less classical and are more streams of musical consciousness. For him, it was a question of ‘purging’ himself of his Hollywood work and trying to rekindle the genius he felt had been stifled during the Nazi years. He admitted that it was more important to write things down than to exercise editorial discretion. This is apparent – his symphonies are in need of structural editing as well as correcting simple mistakes in voicing, instrumentation and harmony. I was surprised to hear from a colleague that the Wellesz symphonies suffer from the same issues – especially the later ones. Allow me to make one further speculation: writing symphonies was the closest these composers could come to achieving any kind of personal ‘music restitution’ for the years lost to Hitler.